Another sumptuous recipe from the raw kitchen of Jenny and Robin Littman. You won’t believe how tasty this sweet treat is without any added sugars! Blend the dates and dry ingredients in a food processor. Add the coconut butter which has been melted in a bain marie. Press the mixture into a baking tin with a removable base, lined with cling film with plenty of film overlapping the tin so that you are able to lift it out easily later. Put into the freezer for 20 minutes to set. Meanwhile blend the bananas and all the other ingredients for the topping in a blender. Once the base has set, pour in the topping and return to the freezer to set. You can serve in 30 minutes when it should have set. Release the base from the tin and carefully peel off the cling film. Decorate the top with slices of banana and a sprinkle of cacao nibs. 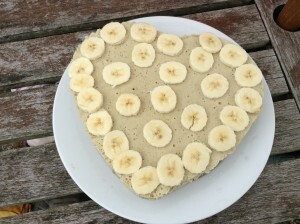 No-one will believe this dessert is raw, and does not contain any refined sugar! YUM! You can join Jenny and Robin Littman and learn how to make delicious recipes like this one at their next workshop in Covent Garden on 11 January.